Ironman and half Ironman performance is all about strength-endurance. This workout will help build bike specific strength. Below the workout I included an audio explanation of why we do this workout. Main set: 10 x 3 minutes hard in as big of a gear as you can handle. Keep cadence in the 50-55 range. Recover with 2 minutes of very easy pedaling. You’ll notice that as you fatigue your body will want to rev up the RPM a bit to get the same output. 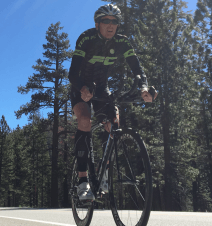 Stick to this cadence target as it will focus on leg strength (the one component that is so important for ironman and half ironman performance). You can finish the workout with an easy spin or if you’d like you can add on as described below. I like to allow 10 minutes of easy spinning and then I complete a 15-30 minute build at race cadence from low Z3 to right about Z4 (depending on where I’m at in my training). This wattage will feel so much more challenging than if you came out of the gates at this intensity, but the fatigue from the big gear work creates the load you typically feel during the second half of your race. OR…. if you have time for an afternoon session, then finish the 3 minute intervals with a 5-10 minute cool down and then add on your Z3/Z4 build in the afternoon (you’ll need to give yourself time to warm up). When I do this in the afternoon, I’ll extend the build to 40-50 minutes. If you can train to be strong in the second half, you’ll be pretty happy with the results.